Choosing a project for this month has been tough, there are a couple of things that I have to get done anyway so I felt I wanted to choose something else that would feel like a big achievement. 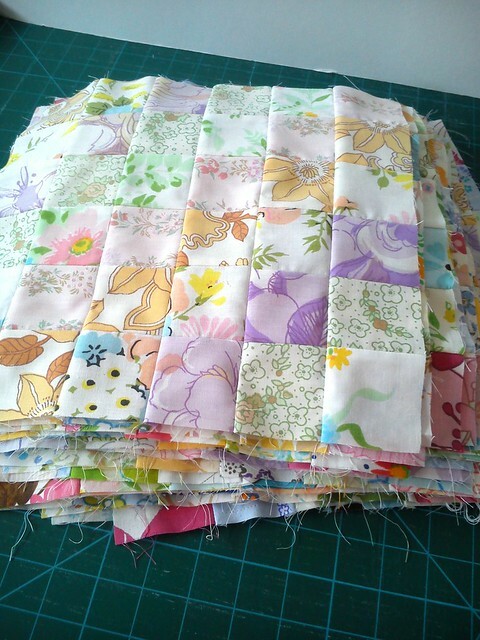 Yes a pile of vintage sheet scrappy trips blocks, approx 40 of them, started back in April, I wanted to make a quilt using every one of the fabrics in my vintage sheet stash! I have left some out as they didn’t quite work; too low volume (hey maybe that’s next a LV vintage sheet quilt), but I have included some odd ones, they really stand out but I guess this is a quilt for me so I don’t mind! I don’t really want to make more blocks so I’ll lay these out and hope that I can come up with a layout I’m happy with, then I will get stitching! So my goal for the month is to have this pieced in to a quilt top, anything more will be a bonus, I can just imagine that it might take a long time to choose a backing for this! Oh My – Looking forward to the end result. Beautiful already! Now I want to go out to yard sales and find more vintage sheets. I only have a couple, inspired by what you have done with them. No photo of them laid out?!? Look forward to seeing more…. Oooh will look very pretty! Ohhh i imagine it will look gorgeous! Great way to use them all up! The vintage sheets work so well in the scrappy trip along. It will be a gorgeous quilt! Looks great like this…I’m sorry to say that I’ve not used mine yet! It is going to be perfect!!! Can’t wait to see it finished!